Block Making Machine For Sale on our website. You can choose the type and production level for your custom needs under “concrete block making machine deals“. 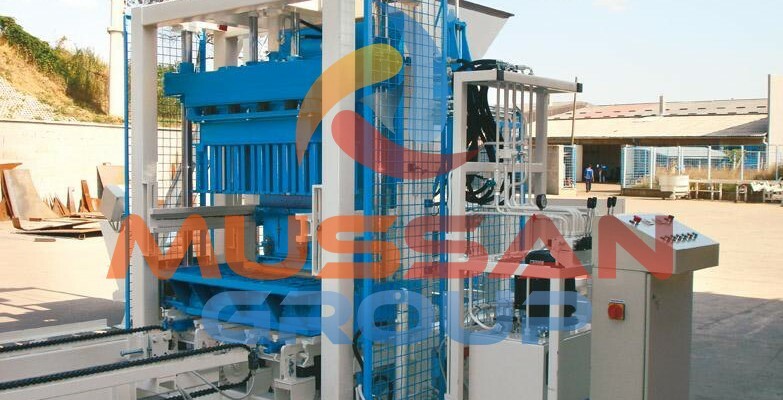 For quick information you might contact right to the factory phone to sales department of Mussan Group and have a chance to get more information about concrete block making machines. Our deals on block making machines for sale are customized according customers requests for most common sets of factory. To have the factory of concrete block production, almost all customers need to or already have mixers, convey belts as extra module to increase productivity of the brickyard. The convey band / belt, automates spelling of the concrete to press making machine. Some of our block making machine for sale has ability to automatically to pore the wet concrete mixture onto block molds. Right after homogeneous mixture is on molds, hydraulic press vibrates and pushes tons of pressure onto the mixture to form a strong homogeneous brick. Pallets are wooden potlike, flat surfaces cut according brick molding area, for transportation of concrete blocks to drying yard. The custom designed pallets, might have metal outer walls to keep form and usability for a long time. Some Block Making Machines like MG 10.2 Semi-Automated Brick-Paver Making Machine have a need for pallets having foots for dispanser system, to put them one onto another. To read more about Automatic Brick Making Machine , click the link below.